Last night was a bit of a mess. For reasons unknown the Wombats both lost their ever-lovin' minds. Nothing we could do could really calm them down and we spent two hours fumbling our way through every trick in our arsenal until they both ended up asleep and we both ended up feeling as though we had gone through battle. 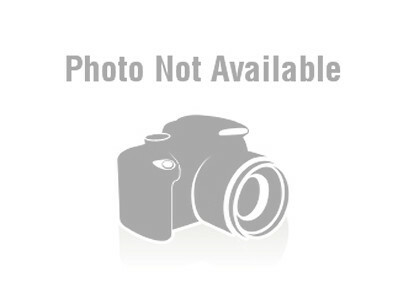 For that reason we have no pictures from yesterday. Just imagine the worst calamity you can imagine and that will probably be pretty representative of our night. 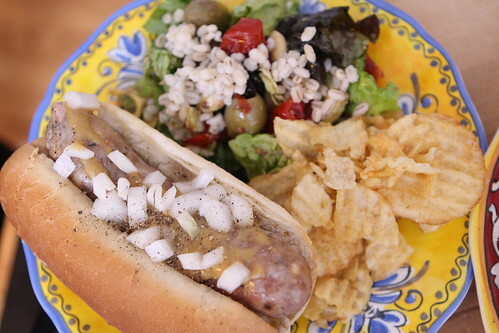 After we recovered from the horror show I seared up some pork sausages and served them in buns with horseradish mustard and chopped onion. I served them with a salad of leftover ingredients and some potato chips. 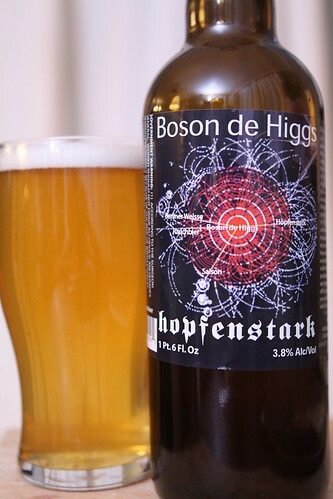 As an excellent accompaniment to these sausages I poured this slightly smokey saison called Higgs de Boson from Hopfenstark, another Quebecois brewer. At 3.8% alcohol I was expecting much less in the way of body and flavor. This was a very tasty, very interesting beer that gets me even more excited about our upcoming trip to the motherland. 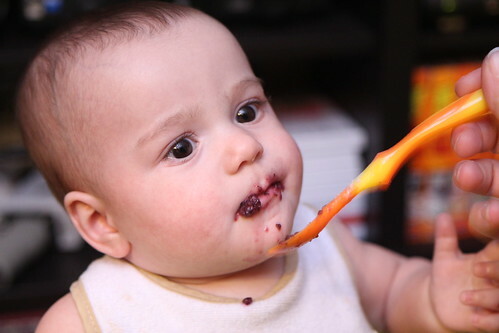 Tonight was a bit easier and we had a chance to made blueberries for the babies for the first time. I was a little worried about this one as they turned out chunkier than any food they've had before. They seemed to like them okay but I think the texture made them not react to this as positively as they have to some of their other past favorites. Apparently they are not aware of just how important antioxidants are. 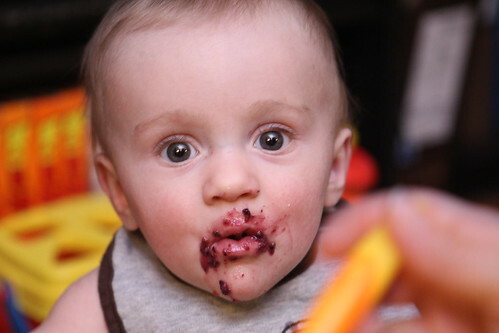 Blueberries were such a mess that we opted to give them a good bath so that they didn't leave blue hand print stains on everything in their tiny little worlds. 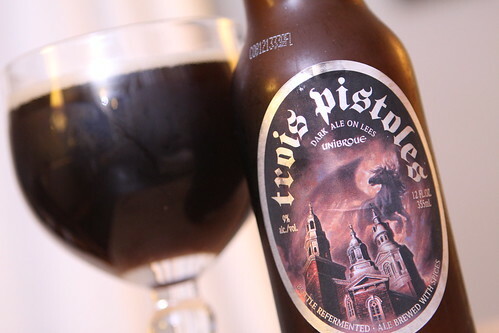 This evening I had another Quebec beer, this Trois Pistoles from Unibroue. I've been desperately trying to figure out if Unibroue does any sort of brewery tours as I'd love to check them out when we visit. There is previous little information online. The best we could do is Jen finding an article from 1997 talking about how they don't do tours. I'm hoping that there have been slight changes in the last sixteen years. 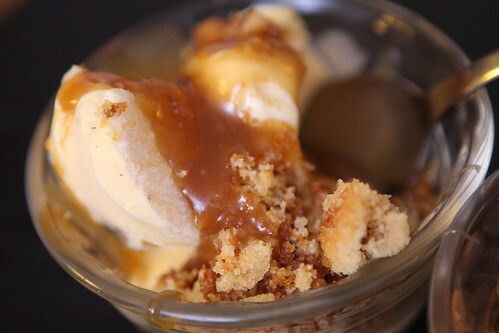 After dinner I used up some leftover ice cream, caramel sauce, and crumbled up cake scraps to make these small desserts. With that the fridge is in a dangerous spot where we may have cleaned out anything worth eating. On the plus side there will be minimal food waste while we're away. On the down side I don't know if we will have anything to eat tomorrow. It's a dangerous game that we play with fridge maintenance. I guess we'll just have to leave home earlier so as not to have to deal with such things.